I read yesterday's article in the NY Times about how people are interacting with religion through social networking sites like Facebook and was amazed at the success of the Jesus Daily Facebook page. It is one of the most popular Facebook pages with over 8.5 million fans. I figured there should be a similar Facebook page that offers users a daily dose of Torah wisdom so I created the Torah Daily Facebook page this morning. The page quickly amassed 100 followers and will continue to grow. The Torah Daily Facebook page will offer daily inspiration from Jewish texts provided by anyone with some wisdom to share. With about a billion users between Facebook and Twitter alone, more topics than just Justin Bieber and Lady Gaga are being discussed on social media networks today. Religion is certainly one of them. An article by Jennifer Preston in yesterday's NY Times ("Jesus Daily on Facebook Nurtures Highly Active Fans") reports that "while it’s too early to say that social media have transformed the way people practice religion, the number of people discussing faith on Facebook has significantly increased in the last year, according to company officials. Over all, 31 percent of Facebook users in the United States list a religion in their profile, and 24 percent of users outside the United States do, Facebook says. More than 43 million people on Facebook are fans of at least one page categorized as religious." The article was prompted by the wild success of the Jesus Daily Facebook page, which was launched by a diet doctor from North Carolina who posts a few motivational quotes from Jesus each day. The Facebook page, created by Dr. Aaron Tabor, has close to 8.5 million fans and, according to AllFacebook.com, in the past three months has had more daily interaction (likes and comments) than the official Justin Bieber page with 3.4 million interactions last week alone. There are now over 750 million people on Facebook so it shouldn't be surprising that users are interacting with pages to find an online spiritual community. If you're already navigating around the Facebook site on a computer, tablet or mobile phone it's much easier to read a spiritual teaching in your news feed than to actually attend a synagogue or church service. Rabbi Laura Baum, a social media maven who is part of OurJewishCommunity.org was quoted in the article explaining how social media has changed our lives. She said, "There are those people who prefer to check out our tweets on their phone or listen to our podcast. I don’t think the use of technology needs to be for everybody. But we have found a community online. Many of them have never felt a connection to Judaism before." 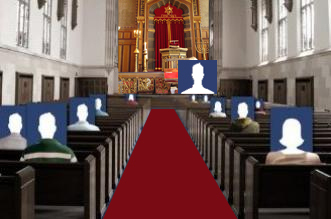 An increasing number of synagogues have found that it is much easier to connect to the membership through a Facebook page than through a traditional website. Like a website, the Facebook page is an efficient way of disseminating information for a congregation, but it adds the social interaction features that promote community and have made Facebook the killer app of social media. Linda Jacobson, the president of start-up congregation B'nai Israel Synagogue in Michigan has used Facebook to connect with members and reach potential members. "Our website is great for publicizing calendar events, displaying photos and telling visitors about our congregation. But Facebook goes well beyond that," Jacobson explained. "It allows our followers to interact with that information and with each other. There's an entire 'backchannel' that brings people together virtually to share photos from our congregational programming, comment on lifecycle events, create sub-communities based on interest categories and coordinate meals when there's a death in the congregation." Jacobson seems to have put social media to good use because she's seen her congregation's membership rolls steadily increase over the past year. Rev. Kenneth Lillard, author of "Social Media and Ministry: Sharing the Gospel in the Digital Age," was also quoted in the NY Times article and he concurs that social media tools like YouTube, Twitter and Google Plus in addition to Facebook represent "the best chance for religious leaders to expand their congregations since the printing press helped Martin Luther usher in the Protestant Reformation." Beyond official synagogue Facebook pages, there are many ways in which users are looking to Facebook for spiritual insight and education. Some popular Facebook pages have been created by rabbis in an effort to share motivational teachings from the Torah. Rabbi David Wolpe, the popular author and spiritual leader of Sinai Temple in Los Angeles, has a Facebook page that boasts over 19,000 fans. Wolpe utilizes Facebook to offer short sound bites that both motivate and challenge his readers. He makes a point of trying to respond to all questions on the page as well, which is not an easy task for a busy pulpit rabbi and a highly sought-after speaker like Wolpe. One follower asked if the rabbi had any marriage advice to which Wolpe responded simply "Shared values; forgiveness; deep attraction; resilience; luck; faith." One thing that social networking sites like Facebook have demonstrated is that one need not be an official religious leader, like a priest or rabbi, to dispense wisdom to help guide people in their daily lives. Many individuals and businesses offer a daily prayer or spiritual teaching to inspire their followers on their Facebook pages. Some Facebook users may post an inspirational teaching as a status update. There are businesses that post weekly motivational quotes on their Facebook page as a way to engage their following. As social media increasingly become part of our daily lives, people will find new ways to interact with religion and spirituality. For some, it may be interacting with like-minded people on a synagogue Facebook page. For others it may be learning a different Talmud text each day through a Twitter feed. In the Digital Age, a minority of virtual religionists will emerge. These will be individuals who do not affiliate with a bricks and mortar religious institution like a synagogue, but are nevertheless engaged in many aspects of a faith community through social networking. Increasingly, people will say they are religious or spiritual or inspired by religious texts, but only because they have chosen to plug in and engage with social media.